For this dish you need have all you’re ingredients chopped ready for the pan. 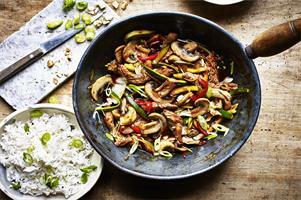 In a wok or large frying pan, toast the chopped cashew nuts until browned, remove and set to on side. Wipe the pan with kitchen roll. When hot fry the beef, ginger and garlic in the sunflower oil until the beef is golden. Next to the pan goes the mushrooms, courgette and pepper, fry for 2-3 minutes before adding the Chinese cabbage, oyster sauce and soy sauce. Bring to the boil, take off the heat, stir in the spring onions and cashew nuts and serve with either rice or noodles, chopped fresh coriander and a little scattering of cashew nuts nad spring onions.